Dog vomit is a tricky substance. If he throws up food, it could be a symbol of an upset tummy or a gunky digestive system. However, if he throws up water or a clear liquid, it could be the sign of something more nefarious. It also potentially calls for action. If you are feeding your dog run-of-the-mill food, switch over to a special sensitive stomach dog food. Sensitive formulas contain probiotics, which help your dog digest food easier. Is Your Dog Actually Throwing Up Water? When your dog vomits a clear liquid, it could be easy to assume simply that he's throwing up water. According to experts, the liquid is not water at all. It is instead gastric juice, an acid that acts as a natural, essential aid for your dog’s digestive system. The reason the dog is throwing up this juice could be something as simple as eating a piece of irritating food that gets lodged in his digestive tract. It could also be neurological in nature as dogs may vomit as a side effect for getting worked up. In the case of the latter, his tendency to vomit may lessen if he calms down. In some cases, a dog throwing up could be a symptom of a more serious condition, such as tumors, liver dysfunction, or thyroid dysfunction. With the latter issue, the vomiting may happen if the dog has an underactive thyroid (hypothyroidism) or an overactive thyroid (hyperthyroidism). In these conditions are suspected, you should see a veterinarian as soon as possible. Sometimes, the liquid that a dog vomits falls under a different classification: bile. Created in a dog’s liver and stored in his gallbladder, this substance plays a key role in breaking down food in the small intestine, essentially helping the dog’s body to separate nutrients from waste. Bile is watery when it is vomited, but it is yellow-green in color. If your dog vomits bile, it could just be a sign that your dog's digestive tract isn't acting as efficiently as it should. Nonetheless, you should take him to your veterinarian to make sure there is nothing serious happening with your dog's intestinal tract. If there isn't a critical issue behind it, your vet may prescribe drugs or a specific dietary plan to help regulate your pooch's tract. What Can You Do When Your Dog Vomits? Even if the vomit your dog produces looks like clear water, it’s important that you inspect the vomit. 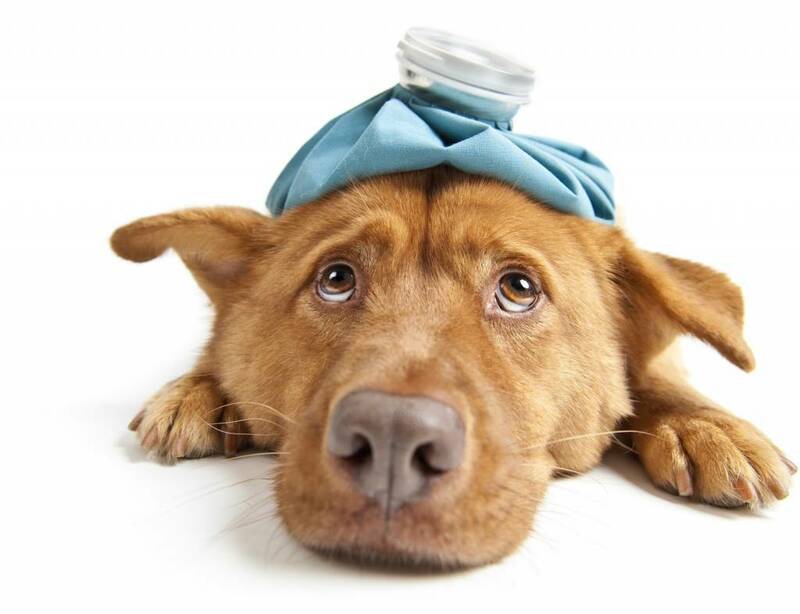 Doing so could potentially provide you with clues regarding your dog’s condition. As you inspect, be sure to keep an eye out for bile, bits of food, or even blood. If you have a young puppy, you should also be on the lookout for chunks of things that he shouldn’t be eating. This could be bits of chew toys or things that he should theoretically be trained not to try eating in the first place, like shoes. The tendency to attempt eating these inappropriate items should dissipate as your dog gets older. What Shouldn’t You Do When Your Dog Vomits? Your first instinct to treating your dog when he vomits is to give him water so the fluids he loses during the vomiting could be replenished. However, this is not the proper response. In fact, giving your dog water can further irritate the reflexes involved with vomiting, which could lead to more vomiting. You also should refrain from trying to feed your dog differently if he's vomiting. As my dog trainer says, dogs are essentially built to thrive on a diet that is based on routine. Above all else, if your dog’s vomiting is persistent, it shouldn’t be ignored. A trip to the vet is the only way to provide your dog with a proper diagnosis and treatment of an issue if it’s serious. It will also provide you with peace of mind, which can be every bit as important. Even if your dog doesn’t develop a serious condition that features vomiting as a symptom, your dog will occasionally throw up. It’s just one of those things that you’ll get accustomed to dealing with as a dog owner. And while this may be a bit unpleasant, it’s a short-term price to pay in exchange for the long-term joy your buddy will bring you. When I calm him down he doesn’t throw it up but if I don’t calm him down he throws it up everytime he drinks water saliva spit please help.me I don’t have money to take him to the dr. 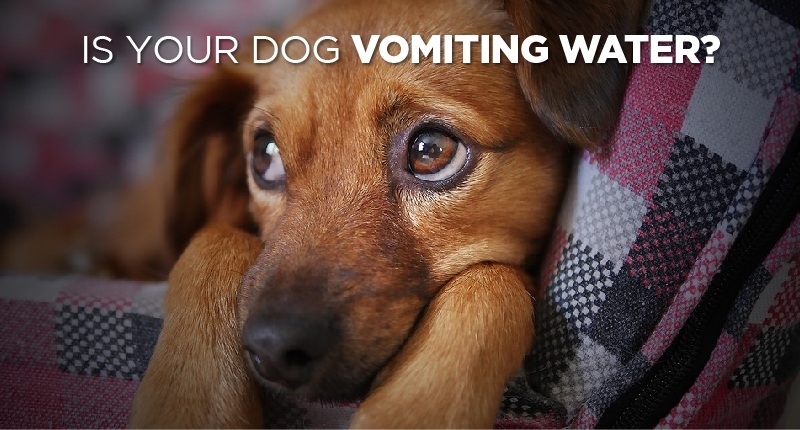 If you re-read the article you would notice that the information shows that the “water” could be gastric acid due to an irritant like bad food or an adverse reaction to the food they’re being fed…The other pup vomiting her food should be an indication of this..You can try changing the food or see your vet !! Hope those dogs feel better soon !! My daschhound is at least 10 yrs old, she has been vomiting water or clear liquid for about 3 days, seems to only be when she drinks excessively. I rescued my Chi from a puppy mill that took her to a kill shelter probably because she was sick. I’ve had blood tests done, x-rays done and nothing has shown up yet. She has been given steroids, antibiotics, anti nausea,acid controller, is on Royal Canin Hydrolyzed Protein Adult Diet and I add a small amount of yogurt with her dry food. She is approximately seven years old and might have IBD. Hi Stella maybe you should cut back on that last meal..It is possible the pup is over-fed. My 3 year old Golden Retriever does the same thing EXCEPT only when I allow him to drink a lot of water very fast. When he eats then drinks he’s fine. Again, it’s only on large consumption of water very fast. On average it takes about 15 minutes to come back up. It’s clear with at times mucus in it but not a lot. He just started doing this a few months ago & nothing new has been introduced to him in every aspect. Off and on my dog will start trembling and limping and become less responsive but he’s usually better in a day or two but it’s fairly often. Today however he was doing the same followed by vomiting clear liquid. I’m very worried. you should consider taking your pup to the vet. Here’s to your pup’s good health !! Joe, have your dog tested for Addisons Disease. Hi. I have a male lab that vomit clear water like vomit. He seems fine happy, loving, and playful but no matter what he eats or if I hold back his water he will vomit. I am on SS and can’t afford alot to have a vet do all kinds of test and possibly still mot help. He foes have a fatty lump on his side. But other then that is healthy. Please help I love my baby and hate to see him suffer. Try giving your pup “dog food for sensitive stomachs” That fatty lump on his side does raise some concerns though ;-(. Visit this link chewy.com and look at all the options for sensitive stomachs dog food. These usually have probiotics that helps your pups digestive system. It appears that your Pup is not digesting her food properly. The constant coughing is also not a good sign. Unfortunately this is one for the vet. You should consult your vet in this matter. My dog is about 1 1/2 years old. Her name is River and she is a Yorkachaweiner (Yorkshire, Terrier, Chihuahua, Weiner Dog). She has been throwing up clear liquid since last night that I know of, with a little bit of grass here and there. When I got home last night is when I noticed her getting sick. I have been up all night with her afraid of going to sleep and getting puked on. She does have a very tender tummy and she loves chewing on anything she can get. I am not working due to health issues and I am on a very tight budget. I have read what was posted up above and yes it does sound like an upset tummy, but still it makes me worry with any kind of vomiting. Should I wait 24 hours and then see if she is still vomiting or what? It appears your pup is spewing out what she ate, and grass appears to be irritant. Monitor her and give her a light meal when she is able to eat. Get hew some chew toys and you will have to train her to not chew on everything. Reward her when she chews on toys and acceptable objects, and be stern with her when she does not. My dachshund is 10 months old and the little light of my life. I’m extremely worried and would highly highly appreciate whatever advice you could share with me. I also have a Yorkie, and since I got her they’ve been obsessed with each other and pretty much the perfect partners in crime. They play from the time they wake up till the time they crash and they both even sleep next to each other on top of me lol. But back to the point, they play pretty rough so when she was a little younger she used to vomit the clear foamyish liquid along with a huge hairball. As she’s been growing she’ll randomly throw up a hair ball hear and there, but recently (the last week or a little less) she’s been throwing up more frequently but no hair balls, just the clear foamy liquid maybe a few hairs in it or even some little tiny like pieces of her toys. But usually it’s been just the liquid. I’m worried does is sound like she may have something lodged in her digestive tract? Should I be concerned?? To your Pup’s Good Health !! What if my dog has been puking clear, very watery vomit every day or every OTHER day for almost 2 weeks now? Who wrote this article? It clearly sounds (at least at first) as if you are just trying to sell gluten free food. Gluten free food is something that will rarely help digestion issues. Being on a better food will indeed help, but gluten free is not necessarily better. Dogs need grains to have a balanced out diet. In fact, usually if a dog has an allergic reaction to something in food it is most likely the protein (however, there are always special cases). A better bet is to look for a food that has a different kind of protein, like fish. Also I would like to point out that a few of the foods you have listed have had major issues in the past and do not do extensive research on the effects of their food on dogs. Blue Buffalo has had dogs die from having too much calcium in their food, from not doing the proper testing. If you can not get advise from your vet please do proper research, Hills, Iams, and perinea pro-plan (different from regular perinea) are great foods. Like this article states there are many reasons vomiting occurs, a vet’s opinion is the best solution, esp. if vomiting has occurred on a regular basis. This article should indicate that you should not trust anyone but your vet (who went through extensive schooling and knows a lot more than the person(s) who wrote this article). This article also states its not good to feed your dog differently when having vomiting issues, one of the best things to do if you think its just an upset stomach is to feed a bland diet of ground beef (drained and low fat content, nothing added) and rice. This is like being on the BRAT diet, kind of like resetting the dogs system. Again, always a better option have a vet take a look. My dog is five and is very nervous all the time, she has been throwing up clear liquid on and off for a couple of days now and I have been worried about her. She doesn’t eat a lot in general but her eating patterns have been about the same. Earlier in the article it said that you should switch their diet to a sensitive stomach food but later it said if you change it that would be worse. My dad often takes her for really long walks and runs in the morning, do you think that could be related? My dog is a 8 year old german shepherd and he has no probems in eating and in just one morning he suddenly vomits and trembles, how do I treat this? We have a maltis/papillon mix and he has be vommitting off and on all day.he has been drinking water and seems to be keeping it down.he will not take food even chicken breast.he hasnt vommitted in 3 hrs but is weak and shaking. my pitbull is about a year and half old. she started throwing up three days ago. she wont eat, her nose is wet and cold, and when she drinks she immediately throws it up. taking her to vet tomorrow. will pepto bismo help her until than.